Is Putin "National Leader" or President? Prominent Russian political analysts consider the results of the December 2 elections to the State Duma, the lower house of parliament, and their effect on the race towards the March 2008 presidential elections. International observers above all wanted the parliamentary elections in Russia to be free and fair. I believe that free and fair elections reflect the electorate's preferences. The Russian elections and their results accurately mirrored the people's electoral preferences, as confirmed by recent public opinion polls. In other words, they reaffirmed the will of the nation. 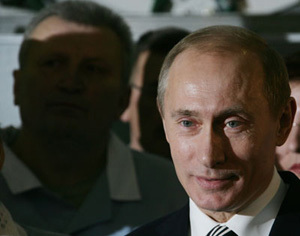 As for their effect on the upcoming presidential elections, the candidate supported by Vladimir Putin and United Russia has a good chance of becoming the next Russian president in March 2008. That is, if he wins the first round. The election results showed that the elections were not a referendum [the pro-Kremlin United Russia party encouraged people to vote in the December 2 election by describing it as a referendum on Putin's policy]. The president's participation in the parliamentary elections has no precedent in international practice. The election results showed that this spurred the activity of both the president's supporters and his opponents. Putin won 64% of the vote, a figure any president would be proud of. Yet the election results were determined by party affiliations, as at least three of the 10 parties that opposed Putin proved that they have a substantial electorate. The only result of the parliamentary elections important for the upcoming presidential vote is that Vladimir Putin has got what he wanted. He had said before that he would participate in the Duma elections to check on the people's confidence in him and confirm his right to remain a major politician after the end of his presidential term. He has received the people's vote of confidence, but a third term for him is ruled out by the Constitution. We have seen a new attempt to legitimise Putin, who wants to secure a place for himself in the country's politics [after the end of his presidential term]. He agreed to head the election list of United Russia and spoke on its behalf, which means that he links his political future with that party. He is likely to become the head of United Russia, and this is the main result of the December 2 elections. The defeat of the centre-right Yabloko and SPS parties was to be expected, although for different reasons. These parties have lost their electorate, who did not come to the polling stations. The Communists will carefully check the election results. [Their leader, Gennady] Zyuganov is spoiling for a fight, and I foresee court proceedings. The elections are not over yet, and this will affect the presidential race, which has already begun, because Putin's [political] future has been put into question. Many Russians are unhappy with Putin, but if he loses legitimacy this will deliver a deathblow to Russia's prestige abroad and to political stability at home.